1. During holidays (Memorial Day, Independance Day, and Labor Day weekends), we require a minimum stay of 3 nights. 2. During peak season (June 23 to September 4, 2017), we require a minimun stay of 2 nights. 3. The resort is closed to the general public during the Sunbanks Blues Festival (May 18-22, 2017 and Sept 7-11 2017). 4. If you are planning to bring your pet and are staying in a cabin or villa, please note there is a $25 non-refundable fee, per day, per pet. 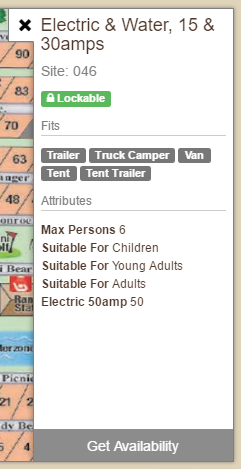 There is a limit of 2 pets per cabin/villa/tent site. 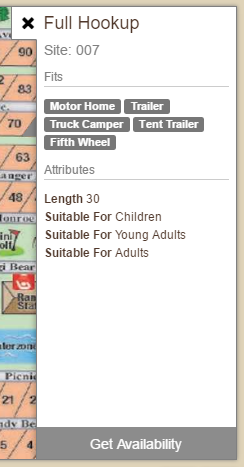 Please indicate if you are bringing a pet in the "Notes to the Park" field on the next screen, after choosing your site type.